What Will You See at the West Street Sculpture Park? In modern times, art has expanded far beyond the realm of paintings on a wall. These days, there are more ways to explore artwork than by visiting a gallery. For example, consider the West Street Sculpture Park. This sculpture park in Galena offers all kinds of curious creations and is a fun alternative to walking through a museum or gallery. Learn more about this unique park below! 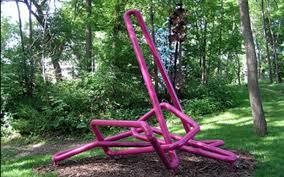 The West Street Sculpture Park occupies two beautiful wooded acres on the outskirts of Galena. The park contains large welded sculptures from local artist John Martinson, rising up in a steely contrast to the natural beauty of the trees and green grass. Martinson also applies his artistic talents at the Galena Blacksmith Shop and Gallery, which he operates with his wife. The natural setting is not coincidental; often, an artist’s decision to construct an outdoor sculpture garden leads to the natural environment acting as a part of the overall work of art. The sharp contrast is supposed to make you think, though a visit to West Street Sculpture Park is not necessarily a pretentious excursion. Some of the sculptures bear whimsical or humorous names, and the West Street Sculpture Park’s website encourages visitors to “stay on the paths, or don’t!” Overall, there’s a kindly, inviting feeling of welcome—it seems that the artist truly does want you to simply enjoy the artwork and its interplay with nature. Visit the West Street Sculpture Park to admire the artwork of Martinson as you stroll along the paths. The artist is often on site and will come out to have a friendly chat with visitors, which is a neat bonus! Admission to the West Street Sculpture is free of charge, so if you’re looking for fun, free things to do in Galena, this is a great place to spend some time. There are plenty of other gems to discover in Galena once you’ve finished exploring the West Street Sculpture Park! If you feel inspired by the artwork, there are quite a few other art galleries and studios throughout Galena. If it was the beautiful sights of the countryside that spoke to you during your visit, there are also plenty of outdoor activities in Galena. Stroll along the Galena River Trail, marvel at the majestic Thunder Bay Falls, explore Apple River Canyon State Park, spot flowers at Linmar Gardens, visit one of the parks—there’s so much to do in Galena, IL! Let us help you plan your trip! Request a copy of our free vacation guide today! Stay With Us at Farmers Guest House! There’s no better place to stay during your Galena experience than Farmers Guest House. We are Galena’s only 1800s-era restored inn, and we’re one of the few historic buildings in Galena that is still fulfilling its original purpose. At Farmers Guest House, we continue a tradition of hospitality and extend a warm welcome to you. Each room offers a blend of tasteful decor, modern comfort, and rich history. Luxurious beds, private bathrooms stocked with soft Turkish towels, and beautiful hardwood floors are just some of the features of our cozy accommodations. 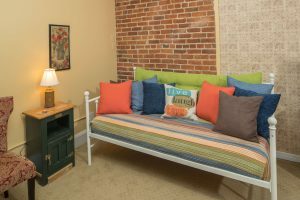 Additionally, as a guest of Farmers Guest House, every morning you will be treated to a delightful, gourmet breakfast prepared by none other than owner, innkeeper, and Breakfast Diva Susan Steffan! This is just a glimpse into all the fabulous features you’ll enjoy during your stay. Be sure to take a look at all of our lovely rooms, and save when you book direct!